I made an error in Atticus’ initial approach to identifying (and reporting on) a very simple success metric for our clients: traffic. Turns out, all traffic is not created equal – specifically traffic to blog content is (usually) much less valuable than other traffic. 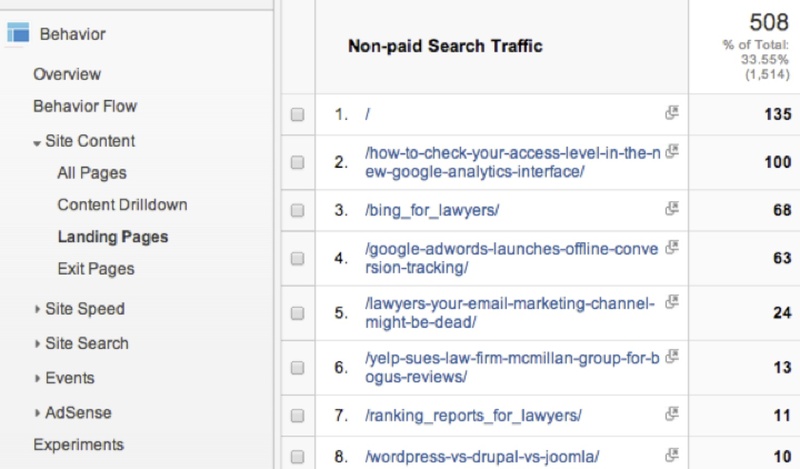 First, I’m going to filter my traffic in Google Analytics by selecting only non-paid search traffic. Now I’m going to look at my site’s most effective landing pages in the Landing Pages report. Now look at the content that draws in traffic – outside of my homepage (which is essentially branded traffic – people who already know me and are actively looking for me), its all blog posts I’ve written about online marketing which contain instructions, news items and search theory pontifications. A full 20% of my inbound traffic goes to a blog post I wrote on “how to check your access level in the new google analytics interface.” The likelihood that one of those users is an attorney actively looking to hire an SEO Agency is exactly zero. This represents a whopping 0.4% of my search traffic and 0.1% of my total traffic. Now, in my situation, this is not a concern as the objective of my blog is to reinforce my credibility with industry leaders not generate new business. However, if I was an attorney who relied on the web for my business’ growth, this is a very concerning statistic. And unfortunately, many SEO consultants and website vendors mask poor business performance with pretty reports of overall traffic growth. Want to see a nice growth graph that hides the fact my traffic isn’t making my phone ring? – below is the graph that shows my site’s performance looks like overall. Note this is driven heavily by inbound traffic to pages that do NOT generate any business. The notion that vomiting out barely tangentially related content on a blog (and the associated traffic bump) to generate traffic is the panacea of legal marketing is utterly misleading. Beware SEO consultants who push clients to write in order to overshadow poor website performance. Instead, take the time to look into those high converting pages of your site – and see how much traffic they are generating. Those are the pages that make your phone ring.